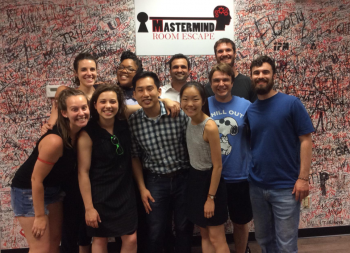 Mastermind Room Escape is our #1 recommendation for things to do in St. Charles and St. Louis – That’s us, and we’re proud of what we’ve created! Plus, we’re the #1 rated escape room in the area on TripAdvisor. With that said, we live and work here so we have a few other recommendations. We recommend these activities before or after an escape room. All recommendations are family-friendly and/or ideal for couples. 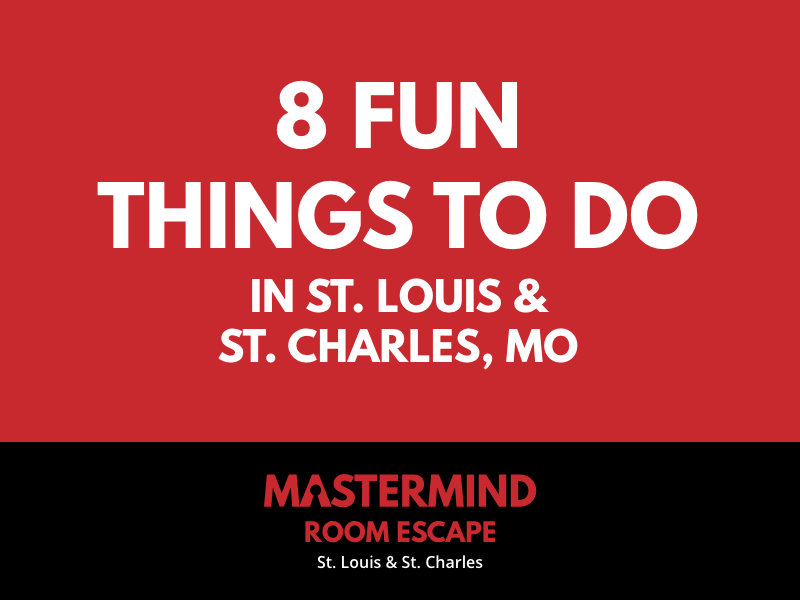 Mastermind Room Escape has locations in both St. Charles and St. Louis. The cities are approximately 27 miles apart. The drive time is 25 – 45 minutes, depending on the traffic and time of day. If you’re visiting the area, then you’re more likely to stay in a hotel downtown. Our downtown St. Louis location is 2.5 blocks or a 5 minute walk from the Cervantes Convention Center. We are a 10-minute walk (or 1/2 mile) from the Gateway Arch. If you’re walking from the Convention Center to the Arch you could easily stop by Mastermind. We hope you appreciate the local insights and recommendations during your visit. From escape rooms to quality pizza and beer, we’ve got you covered. Overall, we are recommending activities that are easily accessible. We tried to avoid the activities highlighted all the time in local and visitor information directories. Destinations like the Gateway Arch & Park, Missouri Botanical Garden, St. Louis Zoo, local breweries and Busch Stadium are all amazing. More information is available in the Discover St. Louis Visitors Guide. That’s us! Yes, we’re biased, and we really, really love what we do. Don’t just take our word for it, we’re also the #1 rated escape room attraction in the area on TripAdvisor. Explore our escape rooms. Top Notch’s St. Louis axe throwing location is in the same building as Mastermind. Reservations are highly recommended and it’s a fun unique activity. Kids ages 8+ are allowed to throw axes with adult supervision. Mastermind Room Escape is a short (.6 miles) walk from Busch Stadium. We even have a Cardinals Quest escape room, which is fun for the whole family before or after a Cardinals baseball game. There’s nothing better than spring and summer in downtown St. Louis. We highly recommend checking out main street St. Charles. There are shops and cafes full of unique items. In the evening, the gas lamps light up making it a truly unique experience. Mastermind’s St. Charles escape room location is approximately 10 minutes from the main street. Keep reading below for our favorite place to eat in St. Charles. Pi Pizzeria MX Downtown STL is the best spot for pizza and craft beer. You can choose a deep dish or thin crust pizza, and there are gluten-free options. Lots of toppings and appetizers are on offer. 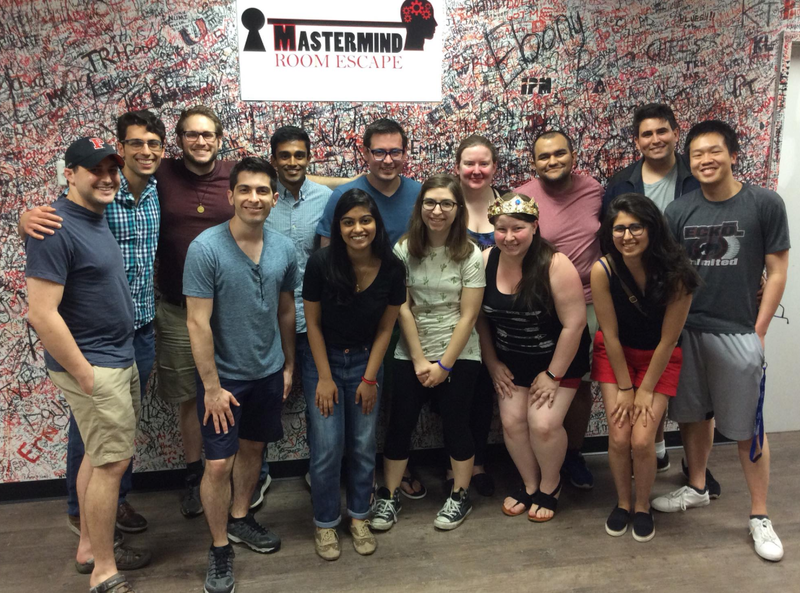 You can even escape a room at Mastermind and walk 5 minutes to Pi. Erio’s Ristorante is our favorite place to eat out in St. Charles. It’s nice, yet casual, and the husband and wife owners are super friendly and lovely to speak with. Their Italian food is delicious and they have a kids menu. Trivia is extremely popular in the St. Louis area. You can find trivia somewhere most nights of the week. Instead of just one location to play trivia we recommend checking out Trivianights.net. This site helps you find trivia nights being held as fundraisers for local community-benefit groups. We like this type of trivia because it’s fun and helps the community! Bring snacks, your friends and family and join in on a big trivia fundraiser night. Two Plumbers Brewery and Arcade is a fun place to recall your escape room adventures. There are 11 pinball machines and over 40 cabinet games like Donkey Kong, Contra and Simpsons. The food is super delicious. What started as a food truck (Guerrilla Street Food) in 2011 is now pork shoulder sandwiches in various forms served amongst the bounty of games. Their rotating craft beer tap selection gets two thumbs up, also! As you can see, there are plenty of fun things to do with family and friends in St. Louis and St. Charles. Mastermind Room Escape is proud to serve people at our two locations. We hope you love it here as much as we do!